Leh cloudburst is unusual, say scientists. Such extreme events are rising. What’s wrong? A cloud burst over arid Himalayan town of Leh in Ladakh on August 6, pouring some 250 mm of rain in an hour. The sudden downpour triggered flash floods and mudslides, killing over 180 people and wiping out the old town of Leh and two villages. Weathermen say the high-altitude town is a desert. It barely receives 15 mm of rain during July and August; the maximum was 96.2 mm about 80 years ago. Besides, the downpour was confined to a small village. This is unusual (see: Why Leh cloudburst was a freak). Such freak weather is not confined to Leh. Northeast India, the wettest region of the country, has received onethird less rain this year. Across the border, Pakistan faces the worst flooding in 80 years. Since July 29, the rising currents of the Indus have deluged three of the four provinces in Pakistan, including the arid North-West Frontier Province, killing 2,000 and affecting 20 million others. Russia fights wildfires stemming from unprecedented high temperatures and a severe drought since record keeping began, and China faces mudslides of an intensity unseen in decades. Would scientists join the dots? "There is a probability of global warming acting as the backdrop of these events but no one can say for sure," said Ajit Tyagi, director general of the Indian Meteorological Department (IMD), New Delhi. Leh has experienced such freak weather before, Tyagi added. In 1953, it received 60 mm of rain in a couple of hours. So it would be incorrect to link Leh cloudburst to global warming. One can only make such a link if there were drastic changes in the rainfall pattern of the region, he explained. Agrees Jayaraman Srinivasan of the Indian Institute of Science (IIS), research institution in Bengaluru. There is not enough evidence to pin the Leh cloudburst on global warming. The problem with mountainous areas is that we do not have sufficient data, Srinivasan said. IMD scientists say it is difficult to obtain such extensive data with only 40 weather stations monitoring the Indian side of the 2,400 km long and 400 km wide Himalayan range. "While weather-monitoring infrastructure has been upgraded and expanded in the plains, we still monitor mountains with stations built during the British period," rued a senior scientist at the Met Office. Most of the stations depend on manually collected data, he added. The best way to ascertain if extreme weather events in the Himalaya are a manifestation of global warming is to study glaciers, said I M Bahuguna, glacier expert at the Indian Space Research Organisation (ISRO), Ahmedabad. Atmospheric warming has a two-way impact on glaciers. One, it melts them down. Two, it leads to reduced precipitation of snow, which contributes to glacial retreat. V K Raina, former deputy director general of the Geological Survey of India, submitted a discussion paper to the Union environment ministry in January, which notes: "Glaciers in the Himalaya, over a period of the last 100 years, behave in contrasting ways." For example, Sonapani glacier has retreated about 500 m in the past century, whereas Kangriz has not budged an inch. Siachen, the longest Himalayan glacier, advanced 700 m between 1862 and 1909, and then retreated 400 m between 1929 and 1958. It has not changed since then. Gangotri glacier, the source of the Ganga, which was rapidly retreating at about 20 m per year till 2000, has considerably slowed down between 2007 and 2009. Hence, Raina notes in the paper, it is premature to state that Himalayan glaciers are retreating because of global warming. "A glacier is affected by a range of physical features and a complex interplay of climatic factors," Raina noted. A similar study by former ISRO scientist Anil V Kulkarni gives a different impression. After studying 1,868 glaciers spread across 11 Himalayan basins for 40 years, Kulkarni concluded the total glacial area has reduced 16 per cent—from 6,332 sq km in 1962 to 5,329 sq km in 2002. "Natural changes in the climate might have been augmented by the enhanced greenhouse effect. And pace of change might have accelerated since the industrial revolution," Kulkarni notes in his study published in Current Science in October 2009. He now works with IIS. D P Dobhal, glaciologist at Wadia Institute of Himalayan Geology, Dehradun, supports Kulkarni's findings. "There is no doubt global warming is changing the Himalayan climate. The snowfall period in the mountains has shrunk by eight to 10 days in the past 10 years and snowfall has become intermittent. Extended summers are changing the ecology of the region," said Dobhal, who has spent 20 years studying glaciers and ecology of the Himalaya. He believes in conducting surveys and recording glacial information manually. According to Dobhal, the divergent views on glacial changes are because of the manner they are studied. Most scientists look only at the snout of the glaciers to draw inferences. Even that is usually done during the summer as large parts of the mountains remain inaccessible in the winter. To understand the link, Dobhal said, one needs to study glaciers as a whole. The anomaly in the weather pattern across the Himalaya has grown in the past 50 years, states a study by Varun Joshi, weather scientist at Guru Gobind Singh Indraprastha University in Delhi. Extreme weather events are on the rise, Joshi said. Being the youngest mountain system in the world, the Himalaya are fragile with high slopes, which make them vulnerable to landslides and flash floods caused by heavy rainfall, said Joshi. 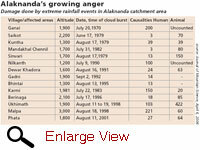 In the absence of sufficient data on extreme rainfalls for the upper Himalayan region, such as the Alaknanda valley, Joshi along with his colleague from G B Pant Institute in Almora, Kireet Kumar, analysed the data of rainfall-induced disasters in the Alaknanda catchment area since 1970 and compared it with weather data of Nainital. "The frequency of extreme rainfalls has increased in the last two decades," they noted in Journal of Mountain Science in April 6, 2006 (see tables). Extreme rainfalls towards the late monsoon due to possible climate change would be highly disastrous, Joshi said. Extreme events are also increasing in Nepal and Pakistan. "Analysis of long-term data is necessary for clear understanding of such phenomenon in the Himalaya," Joshi said. "At the same time awareness about extreme events and related disasters among the residents of the area is needed." Researchers at the Council of Scientific and Industrial Research (CSIR) share Joshi's concern. The northwestern parts of the Himalaya are particularly vulnerable to extreme rainfalls, notes a study by P Goswami and K V Ramesh at the Centre for Mathematical Modelling and Computer Simulation, a CSIR laboratory in Bengaluru. In their paper, published in Current Science on April 25, 2008, Goswami and Ramesh have prepared a map of areas vulnerable to extreme rainfall. Accurate estimate of frequency and distribution of such events would significantly aid in policy planning and observation system design, they said. CSIR researchers are working to set up weather towers in every district along the Himalaya to increase data collection. The 32-metre towers would be equipped with advanced, remotecontrolled technology to gauge minute changes in the weather. This would help ascertain the influence of climate change on the Himalaya's fragile ecosystem. Through a project, SCOPE, the Department of Science and Technology is also establishing weathermonitoring equipments in schools across the Himalayan region. IMD has proposed the government set up advanced weather stations in each basin of the mountains, which would be looked after by a separate Mountain Meteorological division. Maybe the Rs 25,000 crore set side by the government to study climate change impact can be used to improve data collection and analysis in the Himalaya. Where did you get rainfall figure of 250mm per hour where as Air Force station maintains they record rainfall of 12.8mm on 5th Aug 2010. Please specifically quote the source of your rainfall. Secondly had cloud burst phenomenon really would have been the reason then Skampari and Housing colony would have also been affected but they were not at all affected Clould burst is actually no phenomenon which can on its own cause selective destruction the way it happened on 6th Aug 2010. I was in Choglamsar trapped in the mud slush on that eventful hours. Moreover the timings were around zero hours of 6th Aug 2010 and by 12:30 the major impact was almost over. The risk of global warming is getting bigger as the years pass, and it's a subject that needs a lot of concentration to get to a solution. Congratulations. Great interpretation of the theme. Hi Dr Ritesh Arya, i m agree with you but now you should try these devices to know about weather. Thanks Mr Dr Ritesh Arya, i m agree with you. I am pasting a few lines that I have added yesterday on Orkut about Food Like situation that has just came up in Ladakh in this thick of winter. I thought someone may be interested in it. 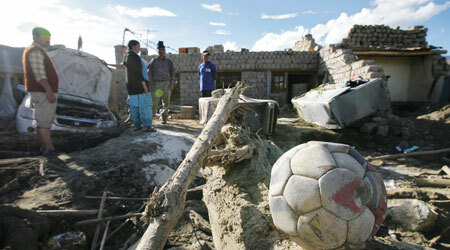 flood situation in Ladakh in the mid of Jan, something unheard of. Ice jams and freezing of shallow river beds are sending a substantial backwater flow flooding nearby areas.Authorities are trying to break the ice and make channels so that course of the river is not diverted, yet the danger remains. (Icelings or ice pellets)which occurs during winter. formed on the shallow river and block the flow of water.